(Fall risk reduction) is no longer a 65+ issue, it’s a 40+ issue. This is the second installment of a two-part look into fall risk reduction with Dr. Debbie Rose, a professor at California State, Fullerton and an expert on the topic. Learn about the cycle of falling and more in Spotlight on Fall Risk Reduction: Part 1. Adjusted for inflation, the direct medical costs for fall injuries are $34 billion annually.9 Hospital costs account for two-thirds of the total. Although the general population tends to think senior living is a one-size-fits-all notion—it’s far from it. Independent living and assisted living are different. Providers need to match the right assessment and program based on the older adult’s functional level. The same intervention for different older adults will not yield the same results if they’re treated by age alone. While the need for more targeted matching increases, so does the need for a combination of strategies. We have to be able to address falls by employing a multifactorial approach: exercise, medication management, home environment, fall protective behaviors, etc. Depending on the setting and the level of fall risk, some or all of these factors should drive the solutions. Dr. Rose says of facilities, “I think there’s an ethical responsibility to provide care,” while adding that the challenges of finding and preparing human resources with adequate skill is a major obstacle she’s working to overcome. The objective is to design effective assessment tools and programs that identify risk factors and minimize the risks of falling or the problems contributing to poor balance and mobility. Ideally, those tools need to be used by qualified specialists. Until facilities change their perspective on budget allocation and ROI, Dr. Rose believes the best immediate solution is to design fall risk reduction programs that can be safely and effectively implemented by less skilled professionals. How do we overcome some of these challenges? Developing products and solutions that work cooperatively with programming is an enormous help to exercise specialists in this field. These benefits also work alongside Rose’s two mantras; assessment drives programming, and a product does not equal programming. These mean that products are generally augmented by the structure that comes from programming. 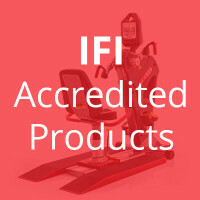 With Fit-Key software, exercise specialists can manually change the programming to fit the individual needs of their clients and incorporate programming in a way that ensures its effectiveness. This also helps with the personnel challenge. If someone is being trained on a certain program, but needs to adjust it based on their client’s needs, they can adjust it within the Fit-Key software so that it better matches their client’s needs. While the core components of the program are unchanged, the experienced provider can tweak the small details without eroding the program’s effectiveness while allowing less experienced individuals to continue following care guidelines. To become catalysts for change, Dr. Rose advocates a solution that comprises “the right tools, the right programs and the right people leading those programs.” There should be early identification of risk factors contributing to falls. “It is no longer a 65+ issue, it’s a 40+ issue,” explains Rose. Follow-up assessments should identify and prioritize risks that can be eliminated. This elicits a clearer picture of internal and external factors that need to be targeted. Additionally, it’s important to have regular tracking of fall outcomes and incidence. 1.) Alexander BH, Rivara FP, Wolf ME. The cost and frequency of hospitalization for fall–related injuries in older adults. American Journal of Public Health 1992;82(7):1020-3. 2.) Sterling DA, O’Connor JA, Bonadies J. Geriatric falls: injury severity is high and disproportionate to mechanism. Journal of Trauma–Injury, Infection and Critical Care 2001;50(1):116–9. 3.) Centers for Disease Control and Prevention, National Center for Injury Prevention and Control. Web–based Injury Statistics Query and Reporting System (WISQARS) [online]. Accessed August 15, 2013. 4.) National Hospital Discharge Survey (NHDS), National Center for Health Statistics. Health Data Interactive, Health Care Use and Expenditures. www.cdc.gov/nchs/hdi.htm. Accessed 21 December 2012. 5.) Parkkari J, Kannus P, Palvanen M, Natri A, Vainio J, Aho H, Vuori I, Järvinen M. Majority of hip fractures occur as a result of a fall and impact on the greater trochanter of the femur: a prospective controlled hip fracture study with 206 consecutive patients. Calcif Tissue Int, 1999;65:183–7. 6.) Hayes WC, Myers ER, Morris JN, Gerhart TN, Yett HS, Lipsitz LA. Impact near the hip dominates fracture risk in elderly nursing home residents who fall. Calcif Tissue Int 1993;52:192-198. 7.) Jager TE, Weiss HB, Coben JH, Pepe PE. Traumatic brain injuries evaluated in U.S. emergency departments, 1992–1994. Academic Emergency Medicine 2000&359;7(2):134–40. 8.) Stevens JA, Corso PS, Finkelstein EA, Miller TR. 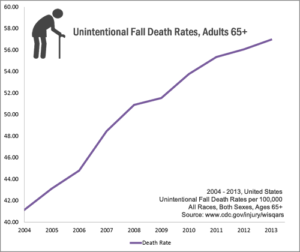 The costs of fatal and nonfatal falls among older adults. Injury Prevention 2006;12:290–5. 9.) Vellas BJ, Wayne SJ, Romero LJ, Baumgartner RN, Garry PJ. Fear of falling and restriction of mobility in elderly fallers. Age and Ageing 1997;26:189–193.